It’s a Saturday and it is raining. Normally, I like to get out and about on Saturday – go for a run, hit the farmer’s market, maybe go for a bike ride with the family, do a little yard work. Today is going to be a rainy day relax, and I think I’m just fine with that. Spring rain in the Southeast is a pretty common thing. It refreshes the soil that has cooled over the winter. It has an amazing ability to make brown things green. It nourishes my lawn and trees so that I can almost see the grass grow. It fills the lakes and streams so that people, animals, and plants can use them and enjoy them. Rain has a rejuvenating purpose for the earth. Rainy days should have a rejuvenating purpose for us humans as well. I’m sure there are going to be a lot of frustrations today at the little league baseball diamonds from parents suffering through rain outs and some fun times at outdoor events like The Queens Cup might get dampened. Rain should be a reminder to us humans, however, that we need to slow down, sit and relax, and allow that time to re-energize us. Even if you don’t get rain to force you to, it is a good idea to build some ‘margins’ into your week. Allow your mind to clear itself, allow your body to have some waking rest, and spend some time in conversation or just being in the same space with those you care about. I hope you get some rainy day relax time this weekend or sometime soon. 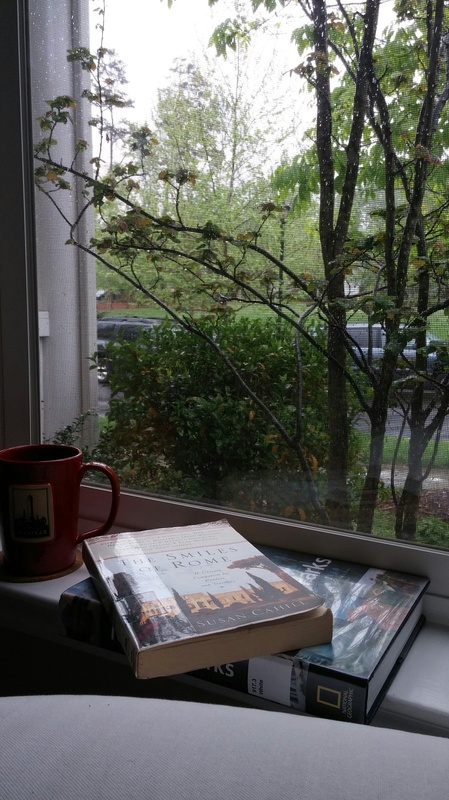 For me, I’ll be getting the view above for a couple of hours today – enjoying a cup of coffee and a couple of books while I look out the front window and watch the rain refresh my grass so I can see it grow. Here’s to a relaxing Saturday.